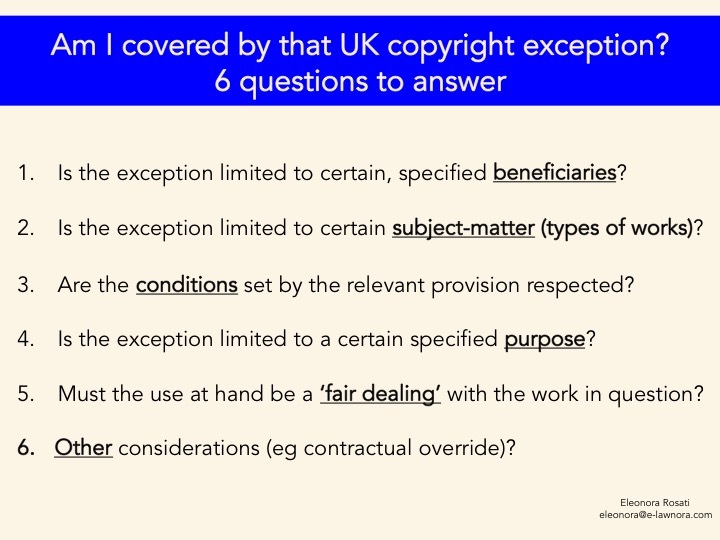 As part of my IP Materials Series, I have prepared a basic checklist for my students (currently busy with their IP revision) of the questions to ask when determining whether a certain exception in the Copyright, Designs and Patents Act (CDPA) is actually applicable to the case at hand. Answering questions 1 and 2 serves to rule out at the outset the applicability to the particular case considered of exceptions whose beneficiaries are limited (eg in the case of exceptions for libraries, archives, public administration, educational establishments, persons with disabilities) or only apply to certain types of works (eg computer programs or databases). In a sense, these are preliminary questions to be considered and addressed. The core of the assessment regarding the applicability of a certain exception to a specific instance is answering questions 3 to 5. Question 3 requires consideration of whether a certain exception requires a number of conditions to be satisfied. For instance, the new (introduced in 2014 and yet to undergo judicial consideration) exception for quotation within section 30(1ZA) requires that: (1) the work has been made available to the public; (2) the use of the quotation is fair dealing with the work [this would go under question e)]; (3) the extent of the quotation is no more than is required by the specific purpose for which it is used, and (4) the quotation is accompanied by a sufficient acknowledgement (unless this would be impossible for reasons of practicality or otherwise). Question 4 requires one to determine whether the exception considered is only applicable to use of a work for certain, specified purposes. While section 30(1ZA) does not require that the quotation is made for any particular purposes, the same is not the case for other exceptions, such as criticism o review (section 30(1)), news reporting (section 30(2)), caricature, parody or pastiche (section 30A). Finally, answering question 6 requires one to consider other factors that might have an impact on the actual applicability of a certain exception. So, for instance, while applicability of the exception for caricature, parody or pastiche within section 30A cannot be overridden by contract (such terms would be unenforceable), the exception is without prejudice to an author’s moral rights. Thank you Eleonora for your analysis. As you know, a proposal for an international treaty on limitations and exceptions is being discussed at WIPO. Argentina submitted a document stating that the main problem of an international instrument on limitations and exceptions is cross-border enforcement. The solution we proposed is "“Where performed in accordance with the exceptions and limitations set forth in this agreement, the reproduction or making available of a work shall be governed by the law of the country in which the reproduction or making available occur, without precluding the reproduced work from being delivered to or used by a person or institution benefitting from exceptions and limitations located in another Member State, provided that such delivery or use is consistent with the terms and conditions set forth in this agreement”. Hi Gustavo, many thanks for your comment - this is very interesting. The proposal looks particularly relevant in the context of online uses ... looking forward to seeing how things unfold! Thanks for this interesting resource, Eleonora. A minor request: would it be possible to match the listing styles of the questions and the explanations? At the moment the questions in the image are numbered 1-6, while the explanatory text is lettered a-f.
You're right Fred! I've now corrected the post - thanks for the tip.